I was born in Bologna, where I still live and work. After graduating from the Istituto Statale d’Arte (State Art Institute) of Bologna, I continued my studies studying art in Urbino, where, in 1973, I became certified to teach graphic design for advertising. The wealth of the city’s artistic resources and preponderance there of Masters of contemporary etching played a decisive role in determining my artistic identity. I tend to stay aloof from the mainstream art world, focusing instead on seeking my own internal harmony, maintaining a running dialogue between my work and Eastern disciplines. In 1992 I began to diversify my work. 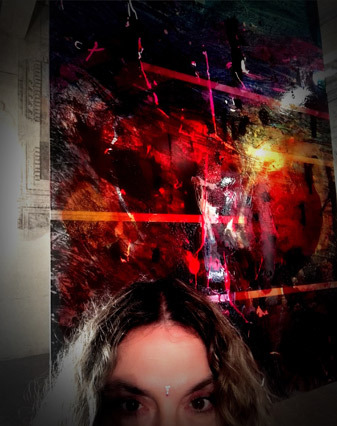 In addition to painting, I began designing and creating glass-panels – light paintings – forming my own company, Vetrate Artistiche Esclusive, of which I remain sole proprietor and artisan. Photographic documentation of this company can be found at the “Centre International du Vitrail” in Romont, Switzerland. My windows and paintings are featured in numerous public offices, banks and in private collections both in Bologna and elsewhere in Italy, as well as abroad. I have been written about by: Roberto Vitali , Glauco Gresleri, Vladimiro Zocca, Romana Loda, Lorenzo Gresleri, Carlo Milic, Giovanna Pascoli Piccinini, ltalo Medda, Luca Ginocchio, Antonio Sanna, Anna Trebbi, Alda Merini, Sandro Malossini, Rafael Nunez. 2018– 21 aprile /5 maggio, partecipazione su invito, a “GENOVA ART EXPO”- Palazzo Stella – Genova. 2017– Partecipazione alla rassegna “Bologna Design Week 2017” con l’ installazione di vetrate artistiche esclusive “Concerto per il Mutamento / A persistent dream zone”, presso Sala del Refettorio delle Monache , ex Convento di San Mattia , Bologna. (ora Istituto Parri). 2016 – Pannello vetrato “MATER MEA DULCISSIMA”-Nuovo ampliamento settore Pronto Soccorso -Ospedale Maggiore-Bologna.Mt.2,40 x mt.2,08- tecniche miste. – Acquisizione blocco vetrato /polittico “I giardini del Negombo” da parte della Scuola di Medicina dell’ Università di Bologna, e sua collocazione nella Hall del Padiglione delle Nuove Patologie dell’Ospedale S.Orsola in Bologna. – Acquisizione blocco vetrato /trittico “Chiaia di luna” da parte della Scuola di Medicina dell’Università di Bologna, e sua collocazione all’ingresso dell’Aula Magna presso l’Ospedale S.Orsola in Bologna. 2015 dicembre, “Vision”, personale Palazzo Pepoli Campogrande (sala Devoré), Bologna. 2014 ottobre, “Carte Segrete”, personale per Amaci – Giornata del Contemporaneo, presso Torre Alberici, Bologna. January, 2014 “Set Up Art Fair”,Bologna. September, 2013 “Assediare l’Arte” group show at Arena Orfeonica, Bologna. October, 2012 “Nutrimenti Terrestri.” One-person show in conjunction with Amaci – Contemporary Art Day, at the “Tedofra Art Gallery” ,Bologna. March, 2011 participation in the 5th International Laguna Art Awards with a glass sculpture entitled “Madama” – Abate Zanetti School of Glasswork Prize. October, 2011 “L’arredamento ufficio incontra l’arte – Tecnotelai presenta le vetrate di Wanda Benatti (Office furniture meets art – Tecnotelai presents glass panels by Wanda Benetti)”. Exhibition /event curated by Officina Immagine Bologna. On display 7 large, shatter-proof glass panels, etched and painted: the triptych “Chiaia di luna” and the polyptych “Negombo”, at the Tecnotelai showroom (Bologna). November, 2011 installation of exclusively designed decorative glass panels in the waiting room of the new Cardiology Department of Maggiore Hospital, Bologna. October, 2010 Murano, at Fornace Silvano Signoretto, creation of 3 solid glass sculptures for a private residence in Rimini. February, 2009 – September, 2011, design and execution of a series of 11 large, etched and painted glass panels, located in a private residence in Rimini. February, 2008 “Galleria Etienne De Causans”, group show, Paris. April, “Mahamudra”. Acrylics, wood, torches. Installation in the courtyard of the Bologna Cinema Library for the “Human Rights Nights” Film Festival. June, “Flowers”. One-person show at Galleria ENNEVU, Bologna Acrylics on cardboard. March, 2007 “Umor Vitreo”. One-person show at “Galleria del Colonna” large acrylic works and etched glass- Bologna. May/June, “Libellula…come un battito d’ali la vita (Dragonfly…like the wings of life beating)”. One-person show at Galleria “Ennevu” Bologna – Ink on paper. June, “Large Acrylic Works” One-person show at the Bologna Center branch of the Banca Popolare di Milano. August/November, Acrylics on display at the “Tecno” Furniture Show-Room in Bologna. September, 2005 “Laboratori mistici (Mystical Laboratories)” One-person show at Galleria GI8 large works on paper – Bologna. November,”Malpensa Arte” Contemporary Art Exhibit – Busto Arsizio.(Mi). October, 2004 “Love Rewind”- mixed techniques. Galleria Ennevu, Bologna. October, Trieste. Group show at Studio Tommaseo. June 2002 “Hearts Landscape & Architetture dell’ Anima (Architecture of the Soul)”. One-person show at Exhibition Hall in the Baraccano Complex, Bologna. Large paintings. January, 2001 “Exit for Roberto Vitali”. Group show at the Germanic Cultural Institute, Bologna. March, Acrylics on paper at Golem Cafè. Art Cafè – Bologna. April, “A futuristic landscape with Mouse & Pad”. Group show in the cultural area of the “Future Show”- Bologna. June 2000 “Andata & Ritorno (Round Trip)”. Participation in a show that was part of the cultural events surrounding “Bologna 2000.” “Il Graffio” Art Gallery. Bologna. November, “World Wide year of the matematics”. curated by Anna Boschi. Group show, Castel San Pietro Terme. Bologna. September, 1999 “The Teddy Bear Collection”, Group show curated by Laura Villani. Cultural Area, Parma Trade Show Organization. October, “Genesis” large paintings on paper and installation. One-person show at “Il Graffio” Art Gallery, Bologna. September, 1998 Promotor, together with Bologna Architect Glauco Gresleri, on a project aimed at the ethical-aesthetic and functional restoration of the Mitilini-Moneta-Stefanini in the heart of the Pilastro neighborhood of Bologna. Proposal presented at the “Bologna 2000-Città della Cultura Europea (City of European Culture)” ( Project in progress). October 1997 “Artisti a confronto (Artists compared).” Group show at “Galleria G28,” Cagliari. March 1996 “Frammenti & Dintorni (Fragments etc. ).” Mixed media on paper panels. Large formats. One-person show “Galleria dei Tribunali.” Bologna. October, 1995 “Il posto delle ombre inquiete (The place of the restless shadows).” Collective at the Contemporary Multimedia Art Gallery di Brescia- as part of the “Art/Cinema” series, curated by Romana Loda. March 1994 Participation in the “International Mail Art Exhibition,” Civic Painting Museum in Pieve di Cento, Bologna. Curated by Anna Boschi. June, “My flowers”. Works on paper. One-person show at the “Navile Cultural Space,” Bologna. Presentation by Roberto Vitali. October, in New York – Exhibition at “Spazio Italia” Art Gallery in Soho, New York. June/September 1993 Participation in the Venice Biennale- Architecture Section- “Architettura nel sacro (Sacred Architecture)”- with painting on photographic panels showing three projects by the architect Glauco Gresleri, Bologna. June 1992 Exposition in the Auditorium of the deconsecrated church of St. Lawernce, in Cento (Ferrara) on behalf of the City of Ferrara’s Study Heritage. October/November, “Prayers / works on paper” – One-person show in the exhibition space of Urbino’s Ducal Palace -“Francesco di Giorgio Martini’s Ramp,” by invitation from the City of Urbino’s Cultural Department. June 1991 “Calligrafie dell’anima (Calligraphy of the Soul)” One-person show of works on paper at the “Savena Quarter Multi-function Room,” Bologna. June 1990 “Segni / grafie /calligrafie dell’anima (Marks/scribbles/calligraphy of the soul).” One-person show at the “Gallery for Contemporary Multimedia Art” in Brescia. February/May 1986 participation in the XVII Triennial of Milan with paintings on wood panels as part of the project “Le Città immaginate:un viaggio in Italia. Nove progetti per nove città (Re-imagined Cities: a journey through Italy. Nine projects for nine cities)”. Architects involved: L.Cervellati, Gi.Gresleri, Gl.Gresleri, G.Trebbi.